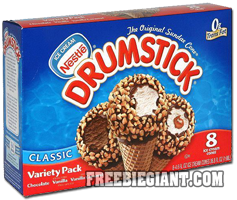 You can get a coupon that is good for $1 off Nestle Drumsticks Cones or Nestle Frozen Snacks. If you would like to get your $1 off Nestle Drumsticks Cones or Nestle Frozen Snacks coupon, simply click here to enter your email address and then print. Limit one coupon per household and you cannot combine this coupon with other offers. Valid while supplies last.